wants us all to know that nutrition is not a four-letter word. He works tirelessly to provide 700 well-balanced lunches and 100 breakfasts each weekday to students, faculty and staff. There are about a dozen vegans and 20 vegetarians who receive special consideration too. “This is my first school,” he said. “What surprises me is how ambitious the palettes are here. It’s not all about cheeseburgers and pizza.” Pad Thai, for example, and leg of lamb are de rigueur at PTS. Vending machines remain a big concern of Chef’s. He’d like to see more nutritious items offered while the companies that own the machines have a different motivation: they stock what sells. Chef Kevin’s major success stories at PTS have been his soups. His split pea, potato cheddar and tomato soups receive cult status. His homemade cookies also, literally, cause a stir. “One day I thought we’d have a riot,” he said. The only bomb so far, he admits, has been a lamb stew, which was critiqued by many as “way too spicy.” Then there’s the legendary tale of the Push Pop Peak. “I like to explore options,” he said “I made push pops that were really, really popular.” There was just one thing that Chef didn’t know: students were bouncing off the walls after they ate them. “I finally got a call from some teachers and they asked me what I’d done!” he said. “They had noticed an enormous spike in energy levels and it was disrupting class.” Needless to say, the push pops were removed from the PTS menu. Chef Kevin MacWhinnie received his B.A. in Education from the University of Wisconsin. He is a graduate of the Culinary Institute in Hyde Park, NY; The School for American Chefs in St. Helena, California; and the Modern Gourmet in Newton, MA. 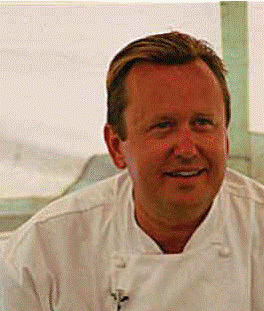 He joined Sage Dining Service, based in Maryland, in June 2004.